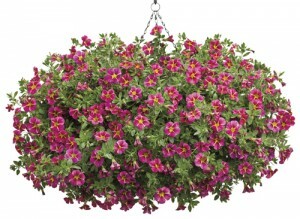 Superbells Cherry Star Calibrachoa. Photo from Proven Winners. My garden is built around perennials, and I would recommend that strategy to anyone. But this year I vow to use more annuals. Yes, perennials are great because they stay in your garden year after year–you don’t have to spend money buying them every year. Plus, they tend to spread. You can start with a small garden and expand it from year to year. The problem with perennials is that while the plants are there all year, the blossoms come and go. My garden looks great in spring when I have many plants in bloom, including narcissus, forget-me-nots, allium, columbine and chives (chives are a tangy herb, but they also get a beautiful flower in spring). Lobularia in basket. Photo from Proven Winners. Then there tends to be a lag as I wait for tiger lilies and black-eyed Susans and hostas to bloom later in the summer. One answer is to try to find perennials to fill in that gap, and I’m working on that. 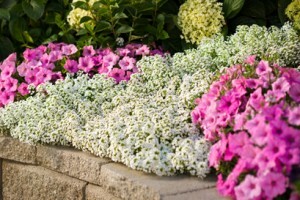 Another answer is to use annuals. But before we go any further, let me explain how I’m using the terms perennial and annual. If something comes back on its own every year in Western New York (even if the plant dies and reseeds itself), I’m referring to it as a perennial. If you have to go out and buy a new specimen of the plant every year, or you have to start it yourself from seed, I’m referring to it as an annual. These definitions differ from the botanical definitions. Lobularia in the ground. Photo from Proven Winners. boxes, deck boxes and planters. If you place annuals in pots that are small enough to be moved, the container can be placed wherever you need color at that time. You have a broader range of plants to choose from when you add annuals to the mix of plants in your garden. In this article, we’ll look at some annuals that do well in sun in Buffalo-area gardens. These suggestions were provided by the staff at Lockwood’s Greenhouses, 4484 Clark Street, Hamburg, NY 14075. This list includes some new annuals as well as tried-and-true annuals. 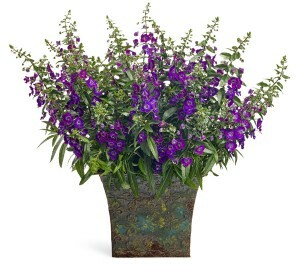 Angelonia Angelface dark violet. Photo from Proven Winners. A new color of calibrachoa, Superbells Cherry Star from Proven Winners, looks great in containers, said Jill Kisker, grower at Lockwood’s. 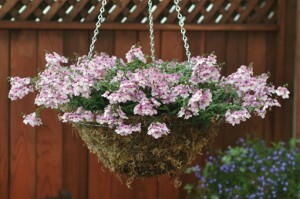 Long, trailing branches will cascade over the side of hanging baskets and spread out in flower beds. Abundant, small petunia-like flowers appear all season and into fall. 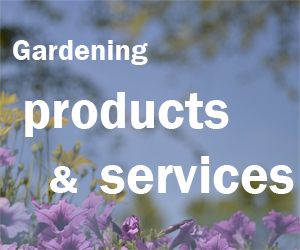 It’s heat tolerant and low maintenance– no deadheading is necessary. It attracts hummingbirds and other birds. Serena lavender pink angelonia. Photo from Ball Horticultural Company. Lobularia was a big hit last year, and Kisker expects it to be popular this year as well. It’s a hanging alyssum that gets big and full. It can grow in a big, round ball. 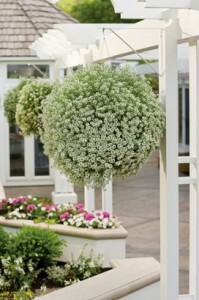 Steve Lockwood, owner of Lockwood’s, noted that lobularia can drape down as much as three or four feet. It also trails nicely when planted in the ground. It comes only in white. It will flower from spring, into summer–and beyond! Kisker said they had a plant that made it through to the middle of December last year. “It’s fragrant, too, which is nice,” Lockwood added. It does take a lot of water, but it won’t look ratty in the middle of summer as some plants do. “It’s a good all-around plant,” Kisker said. 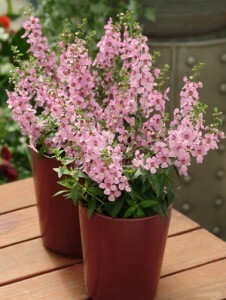 Angelonia is a flower that doesn’t get used enough, Kisker said. It flowers all summer, likes heat and is a good, reliable plant. AngelMist spreading pink angelonia. Photo from Ball Horticultural Company. Because it looks like a snapdragon, it’s often referred to as a summer snapdragon, Lockwood noted. It comes in pinks, purples and whites. There are several varieties. The Angelface series from Proven Winners is 18-24 inches tall. A shorter variety is Serena, which grows about 12 inches tall. A spreading variety is AngelMist from Ball Horticultural Company. You don’t need grass in your front yard– make it a garden!National garden club convention coming to Buffalo– you can attend! If I plant Agapanthus in gallon pots in Buffalo now, will they be in bloom by late July? It is hard to say if the Agapanthus will bloom at all the first year you pot them up. They bloom better when the roots are constricted in the pot and sometimes take a couple years to flower. It also depends on the size and age of the plants. You may have luck if they are already larger, mature plants.